Your SME: When Should You Outsource? SMEs (Small and Medium-sized Entities) go through many cycles, one of which is figuring out how to get their business to the next level. As your business grows you face an increasing need for specialised skills which are either unavailable due to skills shortages, or are too expensive. One of the tools often used to leverage the entity upwards is outsourcing – an organisation commissions third parties to run one or more of its functions, such as human resources. A recent international survey forecasts outsourcing to grow by 12-26% in 2015, depending on the function. The reason it is growing so fast is the incredible pace of new technology becoming available at competitive prices. This has made it possible to source, say, design innovation from a company in Poland. It can lower your costs leading to more sales, greater market share and increased profitability, e.g. shifting manufacture to lower cost countries like China. When your alternative to outsourcing is to increase your staff complement, you avoid all the associated risks and costs, including long-term commitments like employment contracts, additional work space, facilities, management time etc. By outsourcing functions, you can focus on the key areas of your business. Payroll is a frequent example. Outsourcing reduces your capital and funding requirements. For example, outsourcing distribution saves warehouse capital expenditure plus associated staffing costs. These resources can rather be ploughed into the key areas of your business. Often you cannot afford the expertise in-house or there is a scarcity of the required resource. As said above, technology is cutting across borders making it possible to outsource on a global basis. It helps to level the playing fields for small businesses versus the larger corporates who have substantially more in-house support services. It should help to reduce risk across your company which is now partly assumed by the entity you outsource to. The key is to define exactly what you want from outsourcing. This should translate into a clear proposal, so that outsourcing companies can understand your requirements and give you a relevant quote. Once you have decided on the correct outsourcing partner, a formal contract should be drawn up setting out what needs to be done by both parties. Be mindful of any legal requirements that may arise from outsourcing such as how to treat confidential information. The 2015 tax season opened with much fanfare on 1 July. The fanfare was justified as more than 67,000 returns were submitted by the 2nd. Are you liable to pay tax? Liability to pay tax is one thing; liability to put in a tax return is another. It will save you time and stress if you don’t need to complete a tax return. You are a non-resident with dividend income. Then you do not need to complete a tax return. Remember if you are due a refund, you will lose it if you don’t put a return in. If in doubt speak to your accountant. How much interest can you earn tax free? 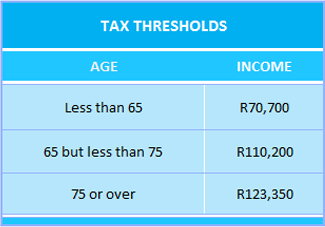 The tax exemption for interest income is R23,800 (if you are less than 65) or R34,500 if you are 65 or older. What’s with the Populated Fields? When completing your tax return online, you will see that some of the data fields have been automatically filled in. It is worth checking that these amounts have been correctly entered. If you need to claim other deductions, such as car allowance, make sure you have the necessary supporting documentation (in this case a log-book), as SARS will want to see this. If you go to a SARS branch to complete your return, you will need to bring all supporting documents, plus your ID. If you use eFiling, you will be required to upload these supporting documents with your tax return. The same goes for other income you receive – for example if you receive business income, then the annual financial statements will need to accompany your return. Get expert advice from your accountant and make sure you get your return in on time and that it is accurate to avoid penalties and interest. Provisional taxpayers on eFiling – 29 January 2016. If someone contacts you saying they can get you a tax refund, and particularly if they request a percentage of any refund obtained, be very suspicious. Also remember, SARS will never ask you for your personal banking details or your PIN number. Make use of the SARS “Report a Scam” facility on their web-site (http://www.sars.gov.za/TargTaxCrime/Pages/Scams-and-Phishing.aspx?k=). Earlier this year the names of 100,000 HSBC account holders were leaked to the media. This became a scandal as HSBC had conspired with its customers to shield them from tax obligations. South African individuals and companies were amongst the names revealed. Clearly, SARS has access to this information. In addition, SARS has been exchanging information with the Organisation for Economic Cooperation and Development (OECD) and has compiled lists of South African taxpayers with investments in OECD countries – these names are being matched to its South African tax database. The USA, Canada and eighteen Western European countries make up the OECD. On August 13th, it will begin issuing audit notification letters to taxpayers who it suspects have been evading their tax liabilities. Affected taxpayers have, per a SARS media release*, until August 12th to enter into the voluntary disclosure program (VDP) to avoid potential criminal prosecution and penalties. Taxpayers who enter the VDP will be required to make a comprehensive and accurate statement of any undisclosed off-shore investments. Ask your accountant for advice in any doubt. *Note that SAICA (the South African Institute of Chartered Accountants) has advised SARS that in its view the SARS media release does not constitute a notice of audit/investigation or awareness by a taxpayer of such audit /investigation. Emolument attachment orders (EAOs), more widely known as garnishee orders, came under fire recently in the Western Cape High Court. Creditors have been getting garnishee orders issued by court clerks (and not magistrates) and they have often gone to courts hundreds of kilometres from where the debtors live. There is no requirement that the clerk of the court should review how the garnishee order would affect the economic circumstances of the debtor - in at least one instance, virtually the whole of an employee’s earnings were subject to deduction. Once a clerk of the court has authorised a garnishee order, employers are obliged to deduct the amount stated on the order from the relevant employee’s wages. The Court was scathing about these EAOs and declared them unconstitutional and unlawful. That they were issued a long distance from the debtors’ home effectively denied these people the ability to appeal the order, a breach of their right of access to justice. The judge also held that judicial oversight must occur with garnishee orders i.e. a magistrate must authorise an EAO. What should employers and employees do? Garnishee orders should be reviewed by employers in the light of this judgment. The fact that the Justice Department has agreed to abide by this judgment indicates there will almost certainly be changes to the law, and in fact the Department has announced its intention to effect amendments as a matter of urgency. Employees should be encouraged to seek legal advice on whether their particular garnishee order is valid and if not to appeal the order. Greece is in an unenviable position – it can leave the Euro and face potential collapse or it can stay in the Eurozone and face years of financial hardship. Pensions are being cut, the retirement age is going up, youth unemployment is more than 50% and the banks are close to collapse. Clearly, South Africa is nowhere near as bad but we can still learn some valuable lessons from Greece. Like us, Greece boomed from 2000 to 2009. The Greeks had a consumer-led boom which created their debt pile up. South Africa’s boom was also consumption driven but there was infrastructural investment and the Fiscus kept debt under control. Since 2009, Greece has implemented several austerity belt-tightening exercises. The reality is that the Greeks, with Euro 320 billion in debt, are insolvent. The austerity measures caused demonstrations in Greece as the population rebelled against this program. Inevitably, populism bubbled up and a leftist populist party was elected to put an end to the “national humiliation”. Yet the crisis has only deepened and the Greek government has accepted terms harsher than the recent ones rejected in a referendum. Country debt does not go away. European countries are refusing to write off debt or to give any funding to Greece without further severe austerity measures. At some stage you or the next generation(s) is going to have to pay for South Africa’s national debt. For example in 1985, South Africa effectively defaulted on its external debt and when President Mandela assumed power in 1994, he was forced to pay off this historical debt, which we finally settled only in 2001. The lesson learned is don’t let national debt spiral out of control. South Africa’s debt has increased considerably since 2009 but the Treasury has been determined to ensure it stays within credible bounds. So far they have been relatively successful. Greece is not too big to fail and cannot go it alone. An unspoken threat running through these negotiations is that it will be devastating for Europe if Greece exits the Euro – the “Grexit” option. Clearly, the governments of Europe are trying to keep Greece within the Eurozone, but there is a limit to this. Greece makes up less than 2% of the European Community’s economy. Globalisation effectively makes it impossible to go it alone – the collapse of Greek banks without European funding illustrates this. The government in South Africa is aware that no country can simply wish away financial discipline in the globalised economy. Greece needs to rein in expenditure and reduce corruption. Greece has not fulfilled many of its obligations since joining the Eurozone. It still has a bloated civil service, cronyism is rife, tax collections are low and Greece is rated the most corrupt European country. This irritates many of its Euro partners – not just Germany. As discussed above, Greece needs to seriously commit to reform. In South Africa both corruption and the size of the civil service have increased – in 1994 civil servant salaries made up 5% of government expenditure and today it is 45%. In addition, we have been slipping in the governance and corruption global indices. This is a concern for South Africans. Corruption has become a daily news item and the increase in the government’s salary bill reduces its options in fully committing itself to the amount of infrastructure spend the nation requires. It is unlikely we will face a Greek debt scenario but there are some signs that we should begin to address some worrying trends. No one wants to be like Greece which has surrendered its sovereignty and faces real hardship over the next generation. The Minister of Labour has decided not to amend the remuneration an employee earns to fall under the protections of the Basic Conditions of Employment Act (BCEA). The amount remains R205,433.30 per annum (R17,119.44 per month). If you are a provisional taxpayer, your first payment for the 2016 tax year is due on 31 August.